Combining Western design and ergonomics with Japanese steel technology, the East Steak Knife Set slides effortlessly into the steak and does not tear or tear the meat when cut. 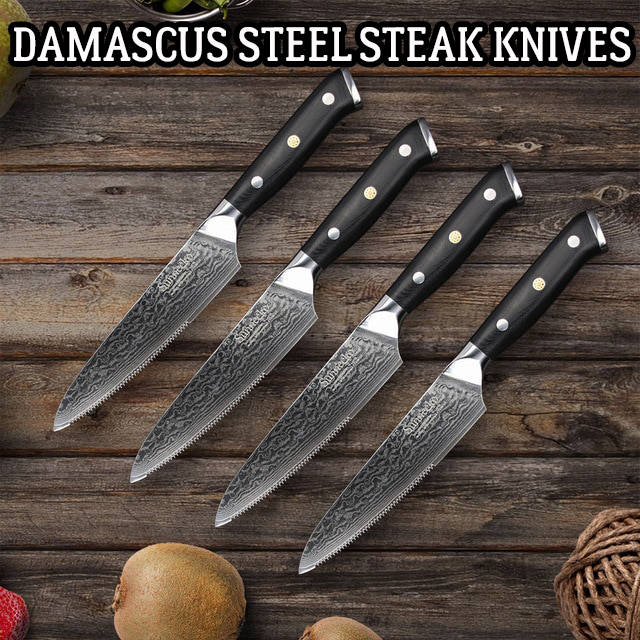 The Damascus steak knife set is made of Austrian AUS-10 Super Steel, imported from Japan, and features a V-bottom without teeth, the perfect companion to the perfect steak. The ergonomically designed knife provides perfect balance control, a G10 handle for resistance and moisture resistance, and a flared end for precise cutting of bone meat. Precision machined from Super-AUS-10 steel and made from 66 high-carbon Japan SUS430 / 431 layers that resists staining and corrosion. 5 “blade with flared rim for removing meat from the bone. V edge without teeth for perfect cutting. (The serrated blades tear the steak). The handle of the Ergo grip is contoured for a comfortable grip. Super tough steel offers a much cleaner blade with twice the blade height of German knives. Full silk is threefold attached to the handle for exceptional durability, with a mosaic rivet for added elegance. The robust G10 fiberglass handle resists moisture, does not change its shape and does not tear. Made by highly skilled blacksmiths in Yianjiang, China, with a 90-day production process. The blades are hand-crafted and honed twice by a traditional Honbazuke technique by talented Japanese artisans. Then a grindstone, custom abrasive grains and mirror polishing on a leather wheel are used. The set contains four 5 inch twin J.A. 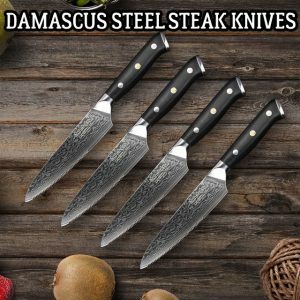 The Bob Kramer Damascus stainless steak knives by Henckels are designed to cut steak and meat effortlessly. Gemini J. A. Henckels is proud to be associated with Bob Kramer, the “master of the blade”. Zwilling J. A. Damascus Stainless Steel Knife Bob Kramer von Henckels uses traditional crafting techniques. The blade is made of super premium steel with a fine-grained SG2 core for extreme sharpness. The core is lined on each side with 50 alternating layers of nickel and Damascus stainless steel, so there is a 101-fold blade with a chevron pattern on the bottom. The blades are hand-crafted in traditional Honbazuke technique and sharpened on wetstones twice with a special grain, followed by mirror polishing on a leather wheel. The blade is then cryogenically hardened, rapidly cooled and then quenched twice to maximize its durability, sharpening the blade angle by 15 ° on each side. The fully riveted and riveted Micarta handle made of linen resists extreme temperatures and resists wear after use. With a signature central pencil made by Bob himself. Made in Seki City, Japan with a lifetime warranty. You can see this amazing set here. The Bontenunryu series includes a VG-10 core clad in Damascus stainless steel. A long time ago, when I was still cooking professionally, I used ryusen knives. 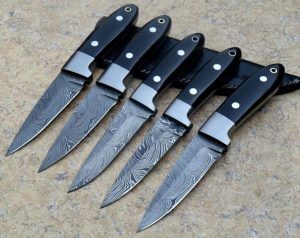 Ryusen was one of the most popular OEM manufacturers in Japan because of its excellent reputation for manufactured knives. More recently, manufacturers have stopped doing OEM work to focus on their own brand. 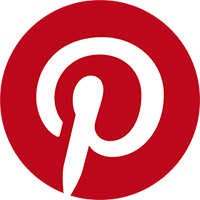 With this change in philosophy, they have intensified their efforts to constantly improve their various series (profiles, grinding, adjustment and finishing, forging, heat treatment, etc.). This is very obvious in their latest offers. They have done their own research and have received extensive feedback from professional chefs and customers. 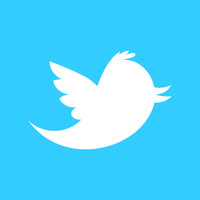 Their business philosophy is that they are open to new and better ways to do things every step of the way. During our visit to Japan in Echizen, we met Ryusen Hamono, the blade manufacturer Blazen. Their commitment to excellence in quality, fit and consistency in each of the lines produced was extremely impressive. It was also clear that they were very careful and proud at every step of the knife-making process they do in-house. From forging to heat treatment, product design and packaging, intelligent and well-designed processes were in place. We are proud to be the only official distributor of Ryusen for America. The Bontenunryu series is a western series of medium weight. Although they are not very light in the hand, they are not difficult … they have a pleasant feeling in the hand. The damask coating is very elegant and the cut and the finish of the blade are very nice. The handles in the western style are also very well made. The knives have a nice distal cone and are ground rather thin on and behind the rim, with a medium thickness along the spine (not fat at all). The VG-10 core is exceptionally heat treated as it uses molten salt baths, which in our opinion is a good way to heat treat this steel. This series is also supplied with a black wooden saga. Copyright © 2019 Timber Ridge Designs, All Rights Reserved.